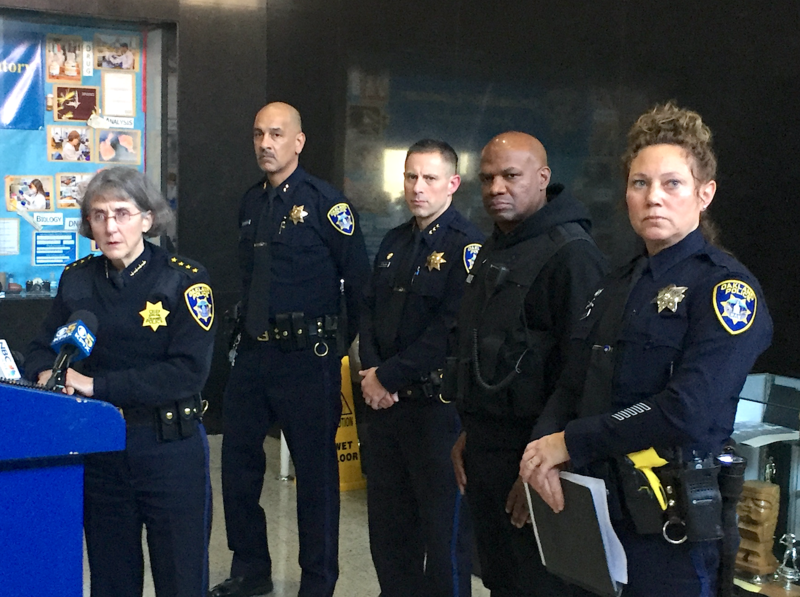 Oakland Police Chief Anne Kirkpatrick and command staff at today's press conference. Over the past 24 hours, dozens of federal agents and Oakland police officers brought a major firearms and drug trafficking case to its culmination by tracking down and arresting suspects in at least seven Bay Area cities. The police also served search warrants at various undisclosed locations. Oakland Police Chief Anne Kirkpatrick called it all "a very large operation." But none of the federal agents working on the case are being paid due to the government shutdown caused by Donald Trump's insistence that a border wall be funded. According to a law enforcement source who worked on the case, between five and 10 suspects were arrested today in coordinated raids in seven Bay Area cities. Over 50 federal agents from the U.S. Marshals, Drug Enforcement Administration, and Bureau of Alcohol Tobacco and Firearms participated in the raids, despite the federal government's paralysis in Washington, D.C.
Oakland police officials said they couldn't provide details about exactly how many arrests were made, and where search warrants were executed, because the case is ongoing. Federal authorities are also insisting on keeping the details quiet, and indictments haven't been unsealed yet. At a press conference this afternoon, Kirkpatrick described the case as a major intervention. It was initiated over a year ago by ATF agents and it was greatly advanced through the use of a ballistics tracing database called NIBIN which can link shell casings, bullets, and firearms across jurisdictions. Kirkpatrick said OPD has been able to recover more than four dozen firearms over the past year linked to the suspects in this case. An OPD press release described the weapons as including "fully automatic high-powered rifles and high capacity magazines." Some of the weapons were trafficked into the city from outlying areas and states, while others were stolen in burglaries, a law enforcement source told the Express. Kirkpatrick said some of the guns have been used in shootings and homicides. Oakland Police Captain Ersie Joyner said OPD officers are "actively looking for other individuals." No federal agency sent a representative to the press conference due to the government shutdown, which bars them from speaking to the media. Today's operation follows an usually violent period in Oakland. Last Friday, three men were shot and killed in a triple homicide in West Oakland. Another man died early Saturday morning of gunshot wounds from a different shooting. Five more individuals were shot and wounded on Tuesday night and Wednesday morning. But last year, Oakland saw a significant drop in violent crime.